To get back to Ye Old Ship we retraced the route down the hill. To our right cars were nose to tail queueing to get to work. A young schoolboy passed us. Large bag on his back, drooping shoulders – he cut a very different picture to that of the boys we saw from the £12,000 a term Winchester College just a few days ago. 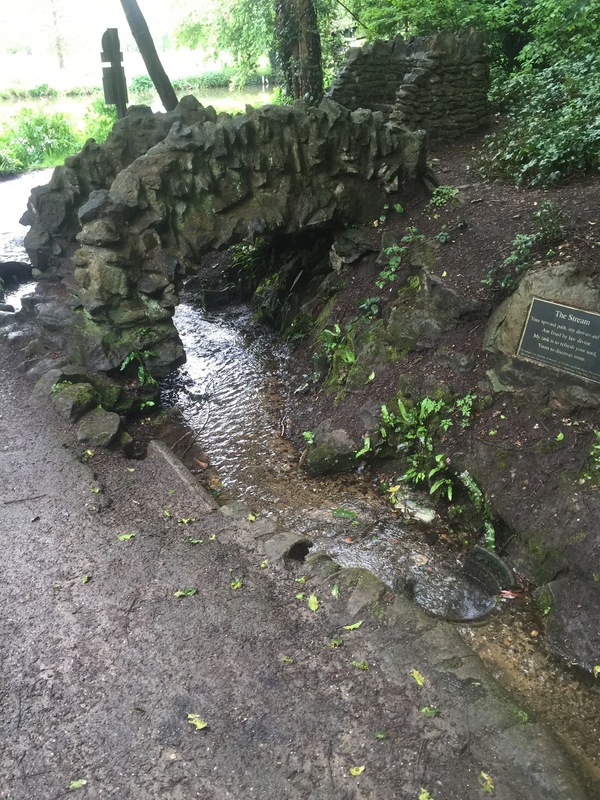 His get up and go had very definitely got up and gone……..
We eventually arrived at the ‘Ship and in no time – just a sharp turn to the left and a few yards down a narrow, steep hill called Ferry Lane – we were in the countryside again! There was a minute bridge over a very narrow water way and even an ode to the water! Nearby was a bridge over the River Wey and we were off. The weather was very dull and overcast. Our route initially took us through Shelford Park and then through a residential street called Pilgrims Way. This sported a very splendid row of beautiful lime trees with their bright green leaves shining in the damp air. Leaving the road we entered woodland and after briefly crossing a road again we were beginning to climb – always a good thing to get your first climb of the day early. St Martha’s Hill lies to the East of Guildford and at the top we got our first of what was to be many amazing views over valleys below. We had reached the Downs. (I have never quite known quite known why such ups are called ‘downs’….. another of life’s mysteries……….). We have noticed another material change to our surroundings – the sandy soil has been replaced by chalk. 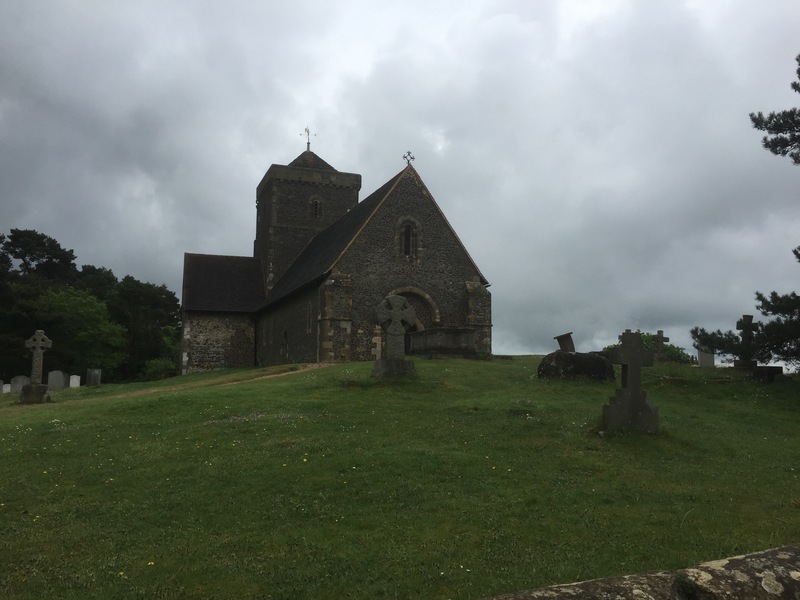 The Downs proper – it is official! 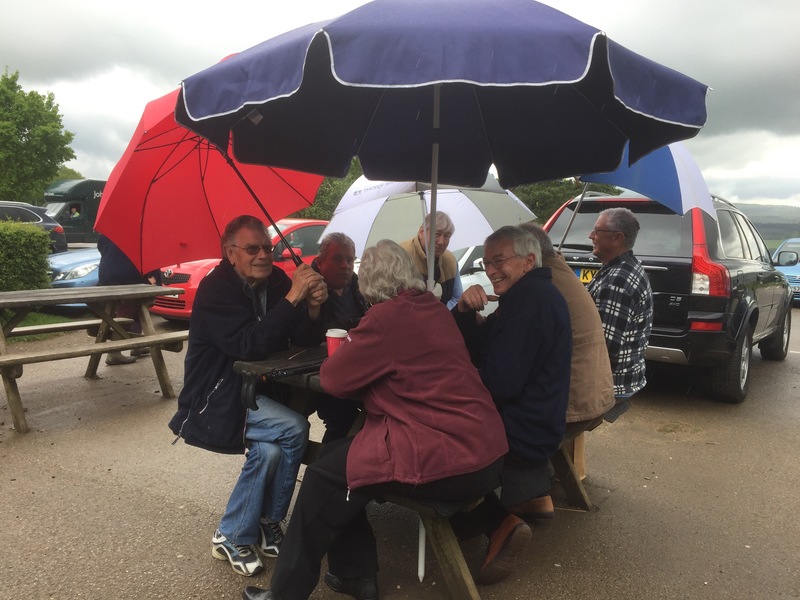 Our walk took us away from the hill top views and to a Visitor Centre where I was amused to see very jolly evidence of Life in the Third Age – a merry group of pensioners undeterred by the weather! After crossing the A25, the still busy predecessor of the horrendous M25, we were back into woodland on an old Drove Road. A reminder of the old parts we are travelling. Our walk continued on through woodland, but by now it has started to rain as we passed a concrete circular tank – a dew pond. 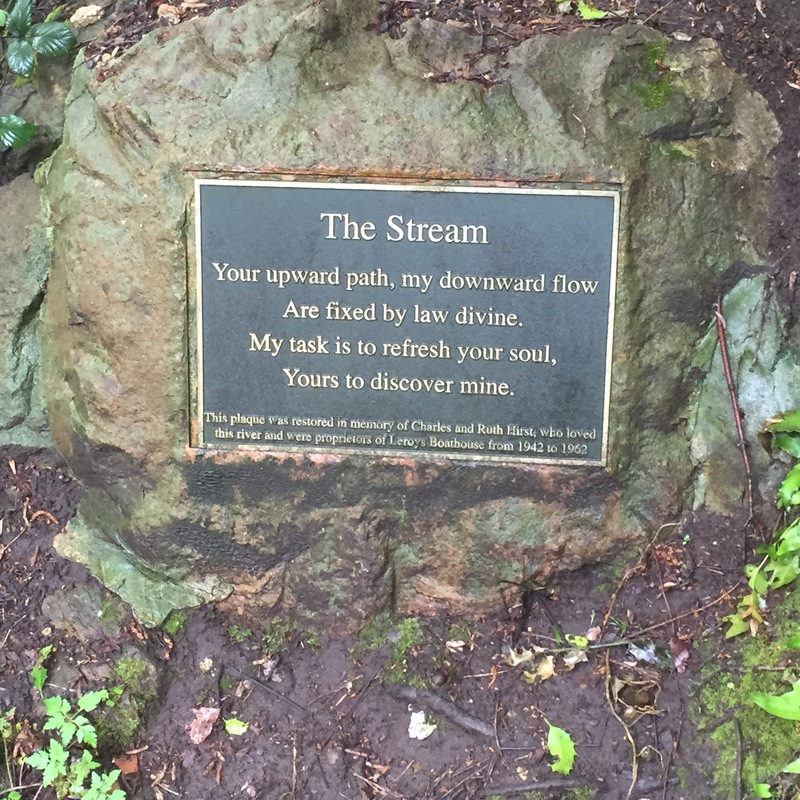 As we moved on through woodland the heavens really opened and for about three quarters of an hour we walked through pouring rain, with rain bouncing up from the path and the route ahead could only be seen through a curtain of water. All that could be done was to just keep moving forward. 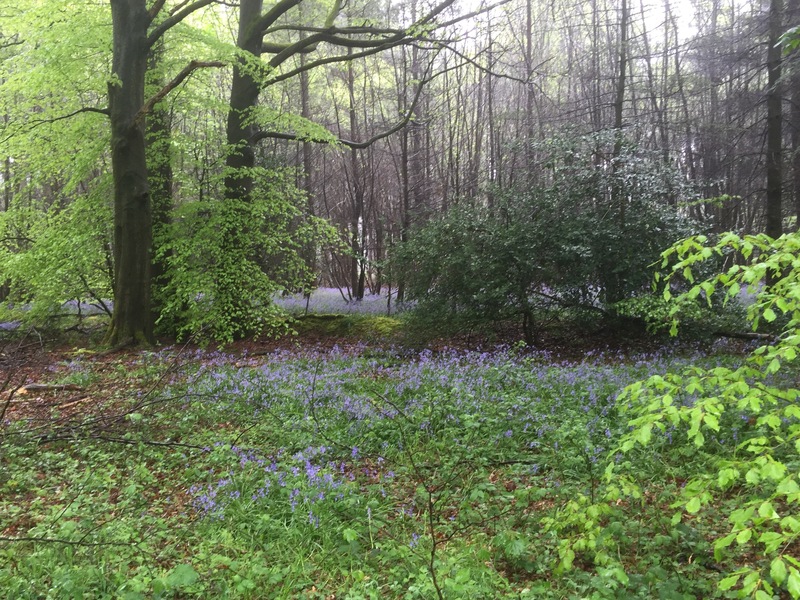 We were back to bluebells to both right and left – a blue haze through the rain. The rain eventually eased up and we took shelter under trees resting on the lip of another dew pond to eat our lunch. I have to report little evidence of dew in the pond but a lot of human detritus – plastic bottles, old cartons and papers – the normal leftovers of over wrapped living, plus odd bits of branch and leaves. A real melange of doubtful content. The North Downs Way continued on out of the woods, along grassy paths and on the occasional cinder track which provided a relief from the puddles the rain had created. 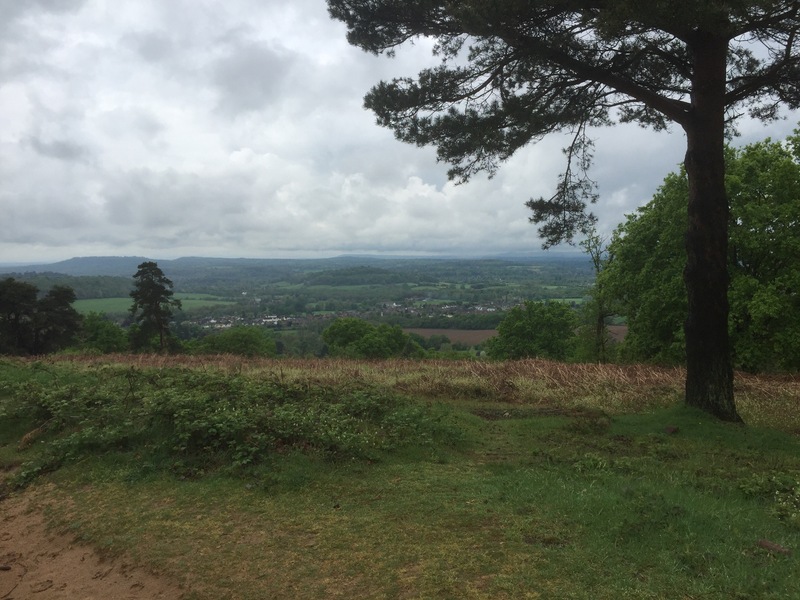 We moved into the National Trust owned White Down Lease with great views to the south over meadows and pastureland and then crossed a chalk track known as Beggars Lane and then on to a ridge which provided more misty views as we dodged in and out of woodland. It was at this stage that we started to see brick pillboxes left over from the Second World War. These continued to appear at intervals as we started to climb again. Several pillboxes later ( I can understand these at vantage points when we were out in the open, but was not sure what they could see in the trees……) we came out into a clearing to see Dorking, our overnight stop location, ahead. To the south on the horizon we could see the tower just visible in the distance of f Leith Hill. Leith Hill is the highest point in the South Easr. Luckily we have not got to climb that one on this trip. Eventually we reached Ranmore Common which should have been near our final destination for the day of Denbies, the largest vineyard in England. Luckily for us Mr Gregory thought it might be a good place to eat on the premises. It was at this stage the night before that we found out that they had mistakenly booked us in for Friday…….. I fear that had we found this out after walking 14 miles it might have brought on one Mr Gregory’s mean moods and Mrs Gregory might have had the vapours. 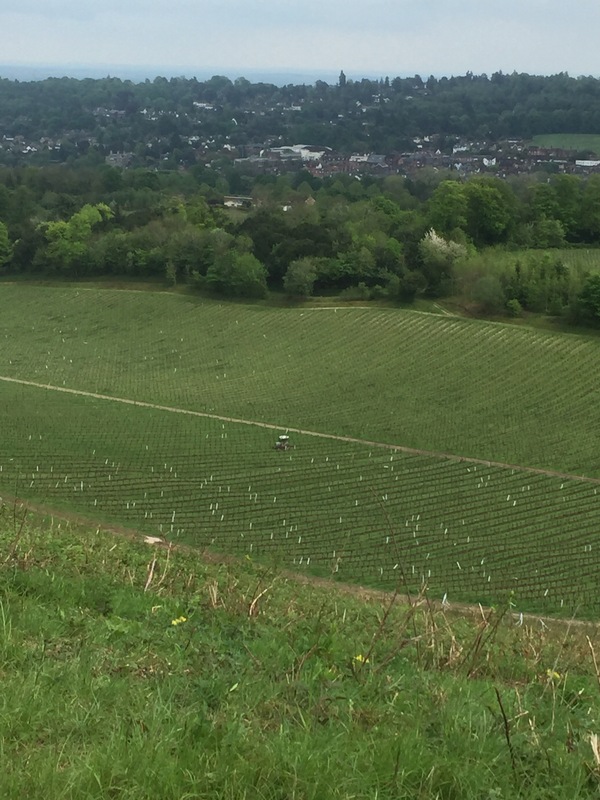 As it was we had the galling experience of having to walk another couple of miles into Dorking through Denbies vineyards to get to our revised accommodation . We were not amused. In the south we have uplands called “downs” and in the north we have hills called “lows” (Kinder low, Bleaklow etc). Don’t you just love our language.